I was going through some of my old photographs and came across this picture. It's a picture I took of a small bouquet of peonies last spring. The peonies have been pushing their way through the soggy soil this past week and it's made me very excited. Peonies, hydrangeas, roses...I xoxo you summer. Mine are coming up as well....I love going outside and seeing how much things change each day. Spring is amazing! 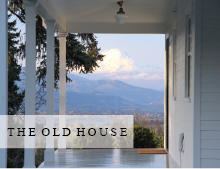 I'm a new reader and find your blog classic and inspiring! The peonies are gorgeous. Hydrangeas are my favorite. Take care! Ah, Peonies are the essence of spring in a sent! My peonies are stretching their nodding heads also. I have about 15 different varieties of them: a growing addiction. But it's a perfect addiction and I look forward to seeing each one of them. Thanks for sharing. I hope your babies will get to enjoy the nice warm spring air soon! Ours have all leafed out, and are just starting to bud...cannot wait! Just lovely, so envious, as we are just heading into winter! My mother has exactly the same vase. peonies are my very favorite of all my perennials and i thrill at the sight of all those buds pushing up through the damp soil every spring! Beautiful! And, you listed all of my favorite flowers...the old fashioned kind. Great picture! My peonies are pushing through too.....can't wait, thanks for sharing! I can't wait to see your bouquets fresh from the garden! One of my favortie flowers...Love this photo! Simply, beautiful. You blog is still one of my favorite places to visit. I can't wait for my garden(in soggy seattle) to start blooming again, Looks like it might be awhile. Cheers to summer on the way! beautiful! you really area great photographer! For a minute I thought you were going to say that your peonies were already blooming! Whew! Mine are just pushing up through the dirt. But at least they are still there!! So pretty. I love Peonies. They not only look pretty but smell so awesome. Great photo. I agree! My hydrangea's are just beginning to push their tiny sprouts of leaves and peonies are standing tall. The bleeding hearts are always the first (and last) to show. I bet you would love them, too. The lacy leaves are beautiful. Mine are dwarf varieties and while they aren't able to be brought inside to vases, they are amazing outside. I actually sighed and went "ahhh' when I saw your sweet peony picture! It was the perfect prettiness I needed to see on this 'yet another' gray and rainy spring (ha) day! Love the little hobnail vase...they were meant for each other. So happy you're seeing those special signs of floral life waking up...they do help keep thoughts of warm, sunny days alive and real. Trina, What a cute picture of the Peonies from last spring. Peonies are so beautiful to me. My mom uses Peonies to decorate gravesites on Memorial Day. Thanks for sharing such a beauty. Peonies are my very favorite but they d nt grow well in NC...not sure exactly why. It may be too humid. I will delight in seeing yours. I HEART SUMMER! Bring it on! Mine are poking through the soil too! Can't wait to see them in June! This post was one reason I know own several of those vases! Very pretty, Tina. I used to grow peonies at our lakehouse and they were destroyed when we had the house renovated. I was so sad. Someday I will plant more. Your picture tugged at my heart! It's so pretty! I need to make sure that I plant some this year! So pretty! Hope all of you are well! Really enjoyed your blog today ~ so serene. Thanks for sharing the beauty. Peonies are so beautiful, I can't wait until the flowers start poking their pretty heads out from the soil over here! 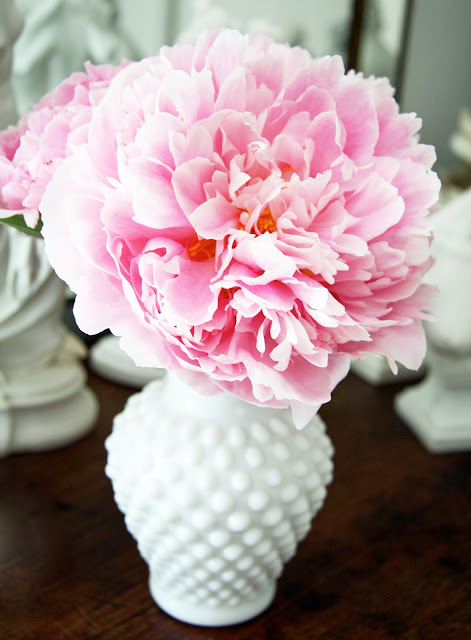 Peonies are one of top three favs (next to lavender and hydrangeas)! Mine are just popping their heads up now. :) Lovely photo! Trina your pictures are always so simple but beautiful. The peonies are no different, they are absolutely fabulous. They are indeed my favorite flower. the peonies are popping up EVERYWHERE and i am sooo excited... dont you just love watching them change and grow... daily??? Peonys are my favorite!! Just found your blog and am the newest follower! Seriously LOVE it. Happy Easter to you, hubby, and your baby bunnies! Love peonies too. So freah and happy inspiring! With so much rain at our home, I am just glad out early spring flowers have not floated away! They are putting up a brave beautiful showing so far. Hope we actually have some clear skies before summer comes! Copyright 2008-2013, A Country Farmhouse. All rights reserved.